1) Vector graphics are soooo cool. Always use them if you can… always. 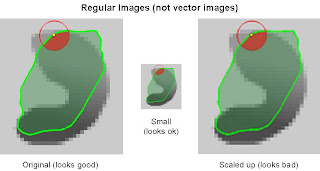 (note: I talk about how to get vector graphics in .eps form out of Matlab quickly and easily here: Matlab TeXniques) For those of you who don’t know why vector graphics are cool, let me enlighten you! When you resize a normal image (gif, png, jpg) you will run into problems (click image above). If you make it smaller, you throw away data, and if you make it bigger, you have to make up data! Both of these are bad. With vector images, though, you can scale them up and down all you like and they look as crisp & clean as the day they were created! Wonderful. 2) If you want to put LaTeX symbols in your power point file, forget TeXPoint… All the cool kids are using TeX4PPT these days. Its *free,* much easier to use, and creates (you guessed it) vector images of your LaTeX stuff instead of bitmaps. One potential hang-up is that it only runs on Office 2003+. Sorry all you guys still on XP. Some slight problems that I had: I think it was due to not setting paths right, but I had to put my .ppt file in the miKTeX root director for it to compile the TeX. Also, you can’t right-click your text boxes to “TeXify” if the text has the squiggly red underline (just find an un-underlined place). 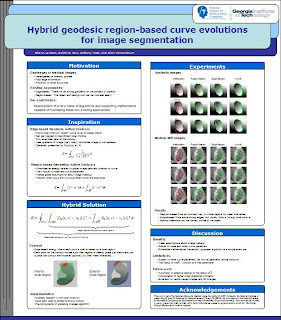 After that rousing adventure in technical advice… if you’d like to see my poster without flying all the way to San Diego, click on the image above to open it in .pdf!